Welcome back to Talking Better with Our Kids, a blog series by Chess at 3. We are focusing on improving the way we interact with our children and students. Last week, we realized that we’re asking our kids a lot of unnecessary questions: Do you want me to help you put your socks on? Do you think we should change your diaper? Do you want to finish your vegetables? If you haven’t read the first blog, you can find it here. Now that we’re aware of the issue, how do we fix it? The words we’re about to introduce are extremely powerful and practical. But I want to warn you: Effectively utilizing them takes practice—just like ice skating or making a really good cup of coffee. Please don’t throw your iPad out the window as soon as you read these words, expecting to immediately command any and every child within ear shot. It won’t work…yet. The magic words are: it is time. What Makes “It Is Time” So Magical? Using the phrase “it is time” starts the process of restoring the parent’s authority in the child’s mind. This phrase both defines the child’s reality and sets an expectation for the future. It’s not contingent on how the child feels, and the parent doesn’t sound like a drill sergeant. 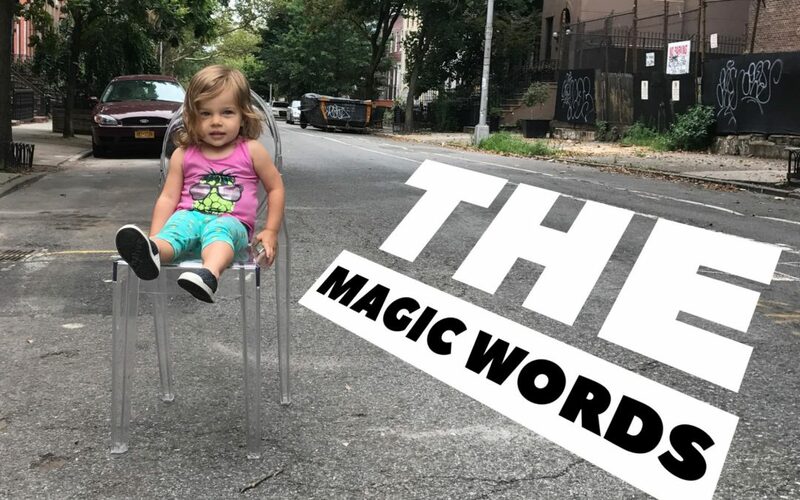 But here’s where the magic begins: Using the phrase “it is time” establishes the parent as the authority and frames the future in a way that is very difficult for the child to argue with. The difference between “I have to change your diaper,” and “it is time to change your diaper,” is small but profound. “I have to change your diaper,” implies “I” have a motive, “I” am in charge, “I” am the person you must argue with if you disagree. A very important detail is: the parent is relaying a plan to the child that doesn’t obviously benefit the parent. This detail makes “it is time,” much more convincing. This linguistic subtlety is one of the most convincing tools I’ve discovered in over a decade of teaching early childhood students. News that does not behoove the messenger is more convincing than a proclamation that makes the messenger the new king. The difference between these approaches is subtle yet massive and is a poignant picture of the raw power of words and the attitude that speaks them. “It is time” is powerful because it removes the parent as the authority. It also introduces a plan that isn’t beneficial to the parent—which makes it convincing. Why would someone invent a plan that not even they want to do? It must be true. It must be time to go to bed. Using the phrase “It is time” is a lot like wearing a fedora or attempting bull fighting: It requires confidence. The words themselves do not contain any compelling psychic energy. The effectiveness of the phrase is contingent on the attitude of the person saying it. Confidence comes most naturally when you’re talking about something you clearly know to be true. If you’re talking about something that is self-evidently true, the confidence that accompanies your words is effortless. You’ve just heard about the concept and phrase “It is time.” It doesn’t yet have the authority in your own mind as something that is “clearly true” does. It will take time and a little practice for you to use “It is time” with the confidence and “matter-of-fact-ness” that you would possess when talking about how tall you are. How you do you begin to build confidence? You need to use “It is time” for something that you don’t want to do—and convince yourself. You need to train your mind to believe the words you’re saying before you expect your child to believe them. What is something you “should” do but don’t want to? I can’t tell you what “It” is time for, but whatever “It” is, “It” needs to hurt a bit. “It” needs to be something you don’t want to do—but will help you in the long run. What is the wet diaper in your life that needs changing? You need to be able to convince yourself that “It is time” to do that thing. You should not want to do this thing—and that’s good! You need to fight against “It,” then submit to “It.” Remember the emotions you experience and defense mechanisms you employ as you’re accomplishing whatever is not natural to you. You can also start to use the phrase, “it is time,” with your child. But for this week, only use the phrase for things your child will naturally want to do: “it is time to watch Moana!” Or “it is time for dessert!” We want to get our children used to hearing these words and become familiar with their authority. Please don’t run home, kick in your front door, turn off the TV, proclaim “it is time for the children to rake the leaves,” and expect silent obedience. It just doesn’t work like that. For now let us just stick with, “it is time to eat ice cream.” Next week we will develop our confidence with this phrase further. Talking Better with Our Kids, Part 2! Do you want to win free Chess at 3 lessons for you home? Each week we’re asking parents to make an Instagram and/or Facebook post about their experiences. Here are the post topics for this week. What is your wet diaper? Find some nagging, neglected task in your life, and tell yourself “It is time to do it.” Take a photo of yourself completing this task and tag @chessat3 with the hashtag #tbwok . You’ll feel great about accomplishing a task and get better at talking to your kids! We will pick the winners on Friday. The 2nd place winner gets a free chess set, and 1st place gets a free in-person chess lesson if they’re in NYC, or access to the Chess at 3 Home Portal anywhere else! Who won #TBWOK Week 1? Unfortunately no one! We had a ton of comments, likes and shares, but no one actually made a social media post about a suggestive question they asked their kid. At the end of #TBWOK there will be a Grand Prize for someone who makes a post about all three blogs. So if you want to be eligible for the grand prize you’ll have to make a post about Week #1 and #2.